... this is how I - a native German - found this book, which I bought during my last stay in the USA. First, this booklet could use some proof-reading, esp. of German names. Besides this, I would really like to explain some matters to the author who is partially right, but partially influenced by his own cultural interpretation. Somehow the author must have met mostly traditional and conservative people, esp. if I consider the part about male and female behavior and how visits are supposed to take place. I am an 40 year old academic and can tell you that we are much more relaxed and emancipated than this booklet makes you believe. Some parts of the book might be very useful - I found the description of the "binding nature" of statements in my culture very eye-opening - it helped me to understand the presumed "non-commitment" and "unreliability" of my American friends, whose statements would be considered in direct translation as "promises" in German. ("I call you", "I do this ...", "I will do my best ..."). However, I suppose there might be better than this. This is a small book that takes no time to read. For me this book was just "okay" not great, not good, not bad.... just "okay" If you are interested in German Culture I enjoyed reading "Those Crazy Germans" more so then this book. 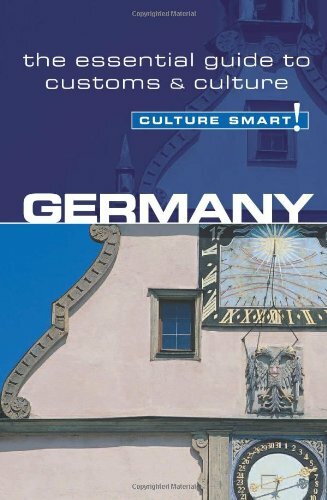 This is an easy to read book that covers some general details of the customs and cultural aspects of Germany.It does not go into enough detail on any given subject to be particularly useful, but it is an interesting read and you will probably learn something new. Excellent - Not Too "Touristy"
Helpful, real-world information on the culture of Germany and the attitudes that are a part of that culture. Detailed pointers on the business world as well as more personal level. Not funky or silly - and not too serious either. Great preparation for visiting or living in Germany. Never feel like a stranger in Germany again! On entering a restaurant, should you find your own table or wait to be seated? What is a suitable topic for small-talk with a stranger? In what circumstances might you ask to borrow ein Handy? 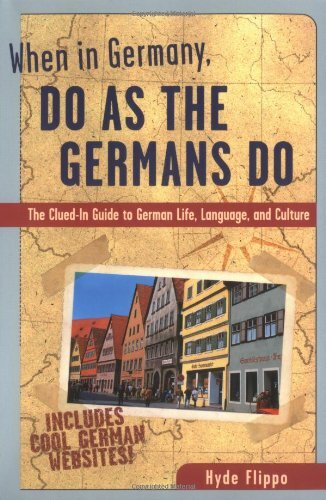 All these answers and more can be found in When in Germany, Do As the Germans Do, a fun and intriguing book that teaches you about Germany's culture, language, and people. Some of the things in this book are dated. I believe the publication was 1999, and in 10 years things have changed in Germany, especially with the adoption of the Euro. Having said this though, there are lessons to be gained, and I still would recommend this to expats to read. The format is very good. Basically, the book is a set of written articles. I would think it would be very boring to read straight through, but the author did a very good thing by putting this little quiz in the front. Each question corresponds to an article in the book. Again, I enjoyed that very much. Recommended for expats...just dont let it be your only guide to living in Germany because of some out of date information. I had hoped this would be a sort of "Year in Provence" set in Germany, but it's more of a book of facts. Once I accepted that, I liked it a lot. It gives some German history and politics, but also covers things like dealing with recycling or what to call the "bathroom." Very useful. Having lived in Germany for a year now, I decided to finally flip through this book, given to me as a parting gift in April 2005. As I read, I was appalled at Mr. Flippo's seeming dislike for Germans. The book is more of a warning for all the traveling American's to be on their guard rather than an informative guide. My favorite quote is, "This "pushy" behavior is not limited to Germans. It's a European thing" (p.31). This extraordinary generalization is quickly followed by the warning that you must either bring your own shopping bags or purchase one in a German grocery store and, as stated by Flippo, "to add insult to injury, you usually have to bag your own groceries". Gee, reducing waste by encouraging the reuse of shopping bags and keeping prices low by simply putting your Müsli in your own bag instead of hiring some prepubescent bag boy to do it for you is a pure abomination and should be henceforth considered "insult to injury" (I'm hoping you're noting my sarcasm). The book continues in this fashion, with hardly a bright comment to be had about this amazing culture. The only reason I'm giving this two stars instead on one is because the author does have a few nuggets of truth and interesting observations woven within his cleverly placed one-liner biases. If you still purchase this book, remember to read critically and differentiate opinion from facts. 60% of contents are useless facts. just on principle, i have returned the book even though it was only $9.it's definitely not for someone looking for a guide to german ways; the book should have been updated since 2002. 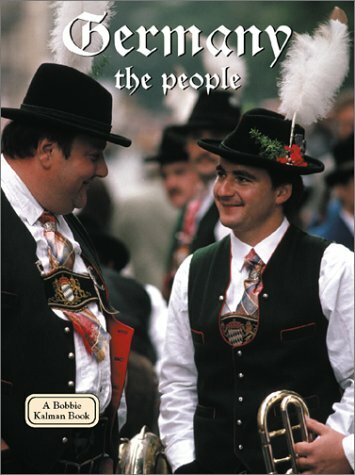 This book is a good reference for anyone planning on spending any time in German Europe.At the very beginning of the book there is quiz to test your knowledge, of which the answers are provides at the back of the book.Flippo uses culture and history to explain the German way of life.He covers all the main travel subjects such as entertainment, food and drink, language, and transportation.He also talks about other topics not often found in the common travel book; such as business and economy, health and fitness, and education. Flippo makes it very easy to read.I would suggest reading the whole book because although some areas may not interest you, the articles are brief and provide a good cultural understanding of the German way of life.Due to the variety of topics discussed in this book, I would recommend it to anyone who plans on spending a little extra time submersed in the German culture.While the book is very enlightening and should be read by everyone traveling to Germany, it covers more than just the basic travel information. Baker, Dalton, and Hildebrandt, working with massive national election returns from 1953 onward, explain the Old Politics of the postwar period, which was based on the “economic miracle” and the security needs of West Germany, and the shift in the past decade to the New Politics, which emphasizes affluence, leisure, the quality of life, and international accommodation. But more than elections are examined. Rather, the authors delineate the transvaluation of the German civic culture as democracy became embedded in the nation's institutions, political ways, party structures, and citizen interest in governance. By the 1970s the quiescent German of Prussia, the Empire, and the 1930s had become the active and aware democratic westerner. What happens when manhood suffrage, a radically egalitarian institution, gets introduced into a deeply hierarchical society? In her sweeping history of Imperial Germany's electoral culture, Anderson shows how the sudden opportunity to "practice" democracy in 1867 opened up a free space in the land of Kaisers, generals, and Junkers. Originally designed to make voters susceptible to manipulation by the authorities, the suffrage's unintended consequence was to enmesh its participants in ever more democratic procedures and practices. The result was the growth of an increasingly democratic culture in the decades before 1914. Explicit comparisons with Britain, France, and America give us a vivid picture of the coercive pressures--from employers, clergy, and communities--that German voters faced, but also of the legalistic culture that shielded them from the fraud, bribery, and violence so characteristic of other early "franchise regimes." We emerge with a new sense that Germans were in no way less modern in the practice of democratic politics. Anderson, in fact, argues convincingly against the widely accepted notion that it was pre-war Germany's lack of democratic values and experience that ultimately led to Weimar's failure and the Third Reich. This book is broadly synthetic, deeply though implicitly historiographical, and deliciously sublime.I've read it now twice and though it may occasionally flag under the impressive crush of its voluminously well-documented research, the clarity of its ambition provides much worth reading and thinking about. 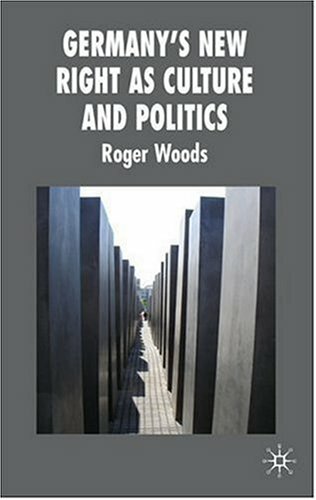 This is one of the most important books written on political culture in Imperial Germany.Anderson skillfully demonstrates that this era contained a vibrant culture of political contestation and democratic spirit.Despite the authoritarian aspects of the Imperial German government and constitution, Germans did not blindly follow the lead of entrenched elites. 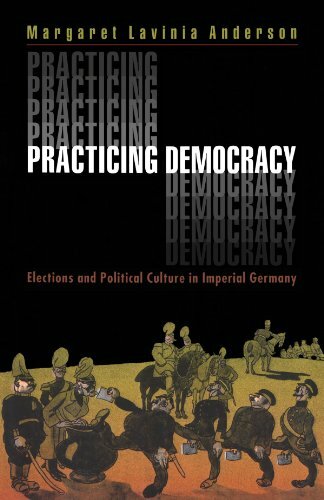 In addition to its many contributions to academic debates in modern German history, _Practicing Democracy_ is a lively, well-written book, with wonderful anecdotes and engaging prose.It would be stimulating even for those with only an amateur interest in history. The recent U.S. election debacle also adds saliency to what Anderson has to say.Much of her material is drawn from the records of election challenges, and offers insights into the difficult process of conducting free and fair elections, while also pointing out that ideas of election fairness are culturally conditioned. I have lived in Germany for quite awhile now, and decided to read this book with the thought that maybe I could learn something new. This is exactly what happened. I was very impressed with Richard Lord's facts and insights into Germans and Germany. Somethings I had already experienced on my own while living here, and other things I had no clue about. Also, there were a few instances when I have viewed things with a questioning look here in Germany, and Lord cleared up these questions for me. 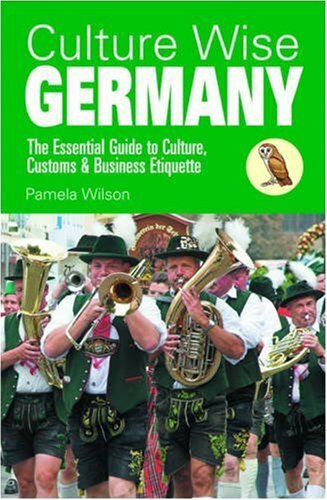 I often ask German friends about certain customs, but this book has given me an indepth knowledge that would have taken me several years to come up with all the questions for my friends. Thank you Mr. Lord for your education on German culture. I can definitely recommend this to anyone planning to live in Germany in the near future. This book had some great information for Americans looking to learn more about the real German culture.However, I had to stop reading it because it was too depressing!I was looking for true, factual information, but I was disssapointed that I had to wade through all of the negativity to get it.Great info, not so great writing...sorry, but those are the facts. 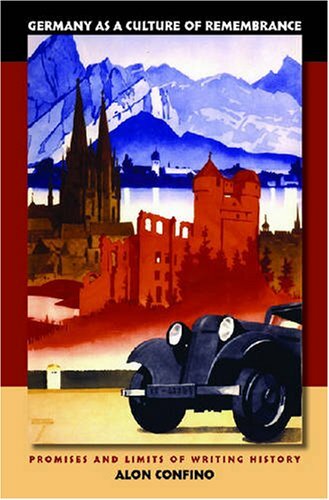 Living for nearly 70 years in Germany as a native born German I don't agree with the negative reviews on this book. I read it with pleasure and found everything almost correct, maybe some smaller items and details could be corrected or updated. Lord gives a short and accurate summary of living in Germany. It is obvious that "each coin has two sides" as we say in Germany - and telling the negative (seeming) facts warning the visitor not to overrate his first impressions surely does not mean that Lord feels any bitterness towards my country. More Germans should read this book - they would become conscious of their behaviour that might seem strange to foreigners and could try to make them more comfortable. I am only sorry that Lord compares only very seldom German habits with US habits. Urgently I should now read another book: Cultureshock USA! I am a German who was given the book by an American and read it out of curiosity. It is a helpful book, and I even agree with most of its not-so-flattering observations and statements about my country. However, it should be taken with a grain of salt: It was clearly written by someone who worked in the business world of Frankfurt, Germany's center of banking and corporate finance, and had rather stiff, conservative suburban upper middle class, suit-wearing business people as his German acquaintances and friends. What he describes as cultural "compartmentalization" between public and private lives applies to conservative business culture (certainly to banks), not so much, for example, to academics, artists, freelancers etc. What's more, Lord's observations apply chiefly to the wealthy,more conservative Southwestern part of Germany between Frankfurt, Stuttgart and Munich, less so to East Germany or Northern Germany. For example, his advice that "upon entering a small shop, one should always intone a robust Guten Morgen, Guten Tag or Guten Abend" should be followed only in small towns and villages, and South Western Germany with its more provincial culture, but surely would raise eyebrows or amusement in Hamburg or Berlin. Same is true for his advice to greet all neighbors or co-workers in a house "in the following manner: 'Guten Tag, Frau Schmidt; Guten Abend, Frau Müller". I had to laugh out cordially when I read that, but, well, it's true to the extent that this is the politeness code if you work in a bank or live in a Western German neighborhood of chiefly conservative senior citizens. Another detail: His remarks about "Hausordnung" (house order) and cleaning the stairs in front of one's apartment again applies to Southwest Germany only, in fact Northern Germans often make fun of this aspect and cite this is as one reason why they never would move South. Or, to take with a grain of salt, too: "Any invitation for Saturday or Sunday afternoon around three or four o'clock always entails a duty to serve coffee and cake". I can only repeat myself andpity the author for having lived in an environment of _extremely_ conservative, possibly old people. 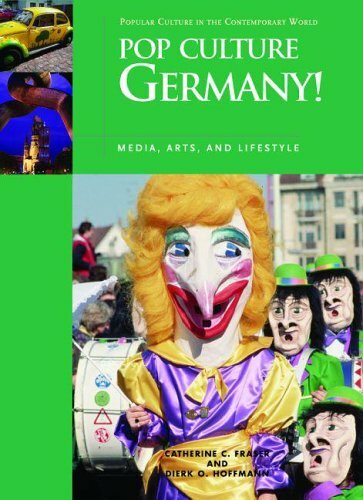 In such passages, the book is actually counterproductive as it creates potentially false images and expectations for Americans visiting Germany. Or the rule of always giving an odd number of flowersto hosts - I admit I have never heard of this in my life, having lived in Germany for more than 35 years... Or the rule that it is considered extremely rude to leave the toilet door open after one has used it. Well, I could go on and on with such examples. They actually taught me something, too - etiquette I have never heard of and I probably should know if I ever worked in an upscale corporate environment between Frankfurt and Munich. So this book is roughly equivalent to a guide to the USA which extrapolates from a corporate work experience in, say, Atlanta to all American culture. I disagree with one reviewer's "bitter undertones" caveat. It simply isn't true. I've lived in Germany for a number of years and everything he writes has also been my experience and I love this country and the people. I got the same 'feeling' from Mr Lord's prose. To hit him over the head about his book dedication is rather much isn't it? It's the "main" reason he stays in Germany, not the only one. German culture, if it isn't one's native culture, presents unique and sometimes frustrating challenges everyday. That's simply the nature of any culture outside our own. I bought this book in spite of reading the "bitter undertones" review and am happy I did because I wanted a book that I could recommend to other newly arrived English speakers in Germany. 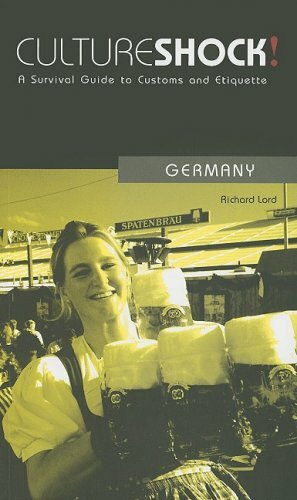 I thought Richard Lord did a superb job and would highly recommend this book to anyone and everyone considering coming to Germany to live or visit. Richard Lord covers all the basics and addresses all the parts that might "shock" if approached unaware (as I did when I moved here in the 90's) so of course his book is going to contain some things that might sound unpleasant - hence "Culture Shock". It wouldn't be called that if people didn't get nasty surprises when they leave their home cultures. All cultures have equal value but going from one to another almost always contains things we initially (or maybe forever) see as negatives. He also addresses all the practical aspects of living in Germany and that, in itself, is more than worth the price of the book in what it will save in lost time, lost money and buckets of frustration. He's done the German people a great service by explaining many of the 'whys' of the ways they live and the things they hold dear. It's especially satisfying to see much of the explanation placed in historical context - where much of cultural habit resides. It's never enough of a picture to know that a culture is "this way" without knowing why because every aspect of a culture is rooted in its very special and unique experience. Once understood in context, it all makes more sense and then it's loads easier to adapt. I expect he managed this so well because he respectfully integrated himself into the culture insofar as possible for someone born and raised elsewhere. Great Guide at understanding culture. I had been to Germany 3 times before reading this.I found each trip to be slightly different.Sometimes, I felt isolated and very alone.Other moments were filled with great conversation and passionate people who were willing to be open with me and try to discuss our differences, similarities, likes and dislikes.If I had read this before going, I would have been more prepared but, I'm glad I found it now. 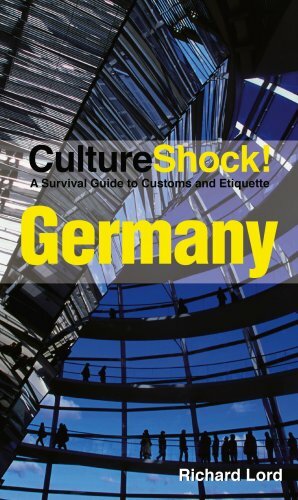 Culture Shock dives into the modern Germany seen from the perspective of a visitor.This means that it's highly general and not 100% set in stone for all peoples of Germany.It covers what a visitor should expect about Germans on a personal, public and professional level.Compartmentalization is highly covered explaining the formalities of society. 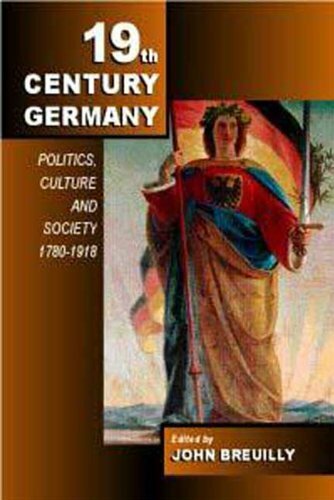 Society, Culture, and the State in Germany, 1870-1930 draws together important new work on the Kaiserreich--the period between Bismarck's unification of Germany and the First World War. Work on the Kaiserreich built up impressive momentum during the 1970s and 1980s, when a series of inspiring but divisive controversies called into question the ways in which German historical development in the nineteenth and twentieth centuries was mainly understood. These discussions focused on issues of continuity between Bismarck and Hitler and the peculiar strength of authoritarianism in German political culture, raising important questions about the deep origins of Nazism and about Germany's alleged differences from the West. The collection purposefully brings certain issues and approaches into the foreground. These include the value of taking gender seriously as a priority of historical work; the emergence of social policy and welfare during the early twentieth century; religious belief and affiliation as a neglected dimension in modern German history; the tremendous importance of the First World War as a climacteric; and the exciting potentials of cultural studies and the new cultural history. A varied group, the contributors embrace different kinds of history and certainly do not subscribe to a common line. Some essays suggest alternative periodizations and focus on the early twentieth century decades rather than the integral unity of the Kaiserreich as such. Together, they take stock of the field, critically synthesizing existing knowledge and laying down agendas for the future. Geoff Eley is Professor of History, University of Michigan. An acknowledged authority on German history and memory, Alon Confino presents in this volume an original critique of the relations between nationhood, memory, and history, applied to the specific case of Germany. In ten essays (three never before published and one published only in German), Confino offers a distinct view of German nationhood in particular and of nationhood in general as a product of collective negotiation and exchange between the many memories that exist in the nation. In the late 1770s, as a wave of revolution and republican unrest swept across Europe, scholars looked with urgency on the progress of European civilization. The question of social development was addressed from Edinburgh to St. Petersburg, with German scholars, including C. G. Heyne, Christoph Meiners, and J. G. Eichhorn, at the center of the discussion. Michael Carhart examines their approaches to understanding human development by investigating the invention of a new analytic category, "culture." In an effort to define human nature and culture, scholars analyzed ancient texts for insights into language and the human mind in its early stages, together with writings from modern travelers, who provided data about various primitive societies. Some scholars began to doubt the existence of any essential human nature, arguing instead for human culture. If language was the vehicle of reason, what did it mean that all languages were different? Were rationality and virtue universal or unique to a given nation? In this scholarship lie the roots of anthropology, sociology, and classical philology. 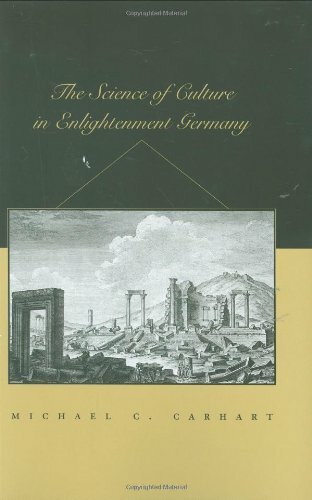 Dissecting the debates over nature versus culture in Enlightenment Europe, Carhart offers a valuable contribution to cultural and intellectual history and the history of the human sciences. My objectives in reading this book were rather simple.I hoped to learn something about the fundamental causes of the hyper-inflation in Germany's Weimar Republic; to gain some insight into its impact on the people who experienced it; and to learn what those people did to survive and protect themselves in such trying circumstances.This book touches briefly upon these topics but goes far beyond my level of interest. The book reads more like a doctorial thesis aimed at exploring the Weimar inflation in all its manifestations -- including its effect on Germany's culture, industry, arts, society, labor, and women -- rather than as a book intended for general public consumption.Rather than simply telling his tale AS HE SEES IT, in easy to understand language, the author devotes the bulk of his book to reviewing and analyzing the works of other intellectuals, authors, essayists, and film makers based on his study of their novels, books, essays, films, and editorial cartoons.As a consequence, readers such as I, not having seen, read, or even having heard of any of these works, must pick their way through a maze of abstract and unfamiliar information much of which seems only tangentially related to the inflation. Clearly, this is a well researched and well documented book, but, in my view, it is not intended for the casual reader or for those who have only a superficial knowledge of and interest in 1923's hyper-inflation.Others may disagree.By my estimate, however, the few pages which addressed the topics of interest to me would have filled only a small pamphlet. i have read lots of books on the topic of inflation and it's causes but this is the first book i've seen which addresses the impact of inflation on the people themselves. 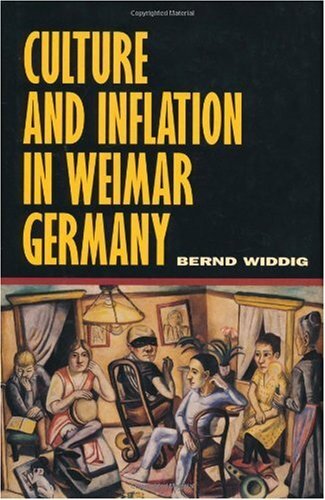 the author peers into the various ways Germans coped with rapidly rising prices, how rapid inflation distorts self worth and the feelings of guilt that mothers and fathers felt as their standard of living collapsed. 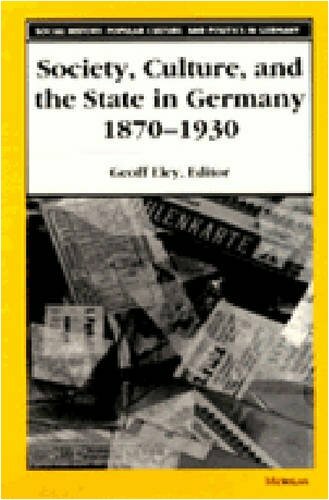 Between 1780-1918, Germany underwent massive changes: politically, territorially, culturally, economically, and socially. In this book, an international team of scholars provides a comprehensive and accessible guide to the subject, organized along chronological lines. The result is an innovative work that blends the basic guidance of a textbook with fascinating historical analysis. 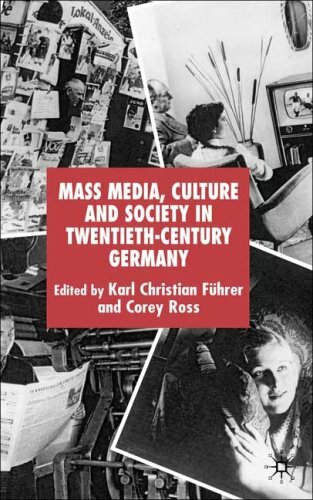 This volume is the first wide-ranging study of the rise of the mass media in Germany from a social and cultural-historical perspective. Going far beyond the conventional focus on the organizational structures or aesthetic content of the media, it investigates the impact they have had on twentieth-century German society under widely varying political systems, and how in turn the media and their uses were shaped by the wider social, political and cultural context. This substantial and profusely illustrated book, with sixteen important essays by major art historians and cultural critics, is the first comprehensive look at the full extent of postwar German art. It includes work by Georg Baselitz, Willi Baumeister, Bernd and Hilla Becher, Joseph Beuys, Hanne Darboven, Hermann Glöckner, Hannah Höch, Jörg Immendorf, Anselm Kiefer, Blinky Palermo, A. R. Penck, Gerhard Richter, Rosemarie Trockel, Werner Tübke, Wolf Vostell, and many others. 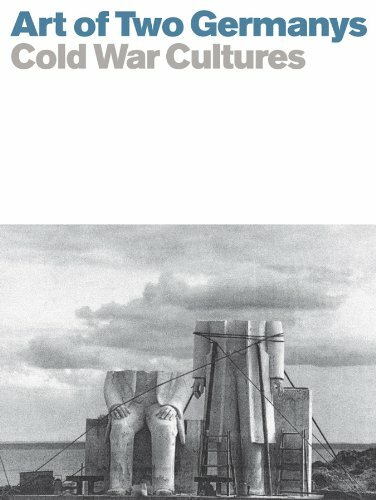 Art of Two Germanys/Cold War Cultures is the catalogue for a groundbreaking international exhibition that reveals for the first time the contribution of both Germanys to the development of contemporary art. That Was the Wild East presents critical insight into popular film culture and art house cinema in Germany from 1990-1999. It examines box-office hits and cult films, such as the "Trabi comedies" and unification farces, which delighted local and international audiences, but which have been granted scarce critical attention up to this point. The first detailed account of the representation of German unification on film to appear, either in English or German, this work provides valuable and engaging source material otherwise inaccessible to non-German readers. In her focus on a range of "unification films," Leonie Naughton analyzes impressions of unification fostered in films from the East and West, along with the comic and tragic anxieties these films attribute to life in the "new" Germany. 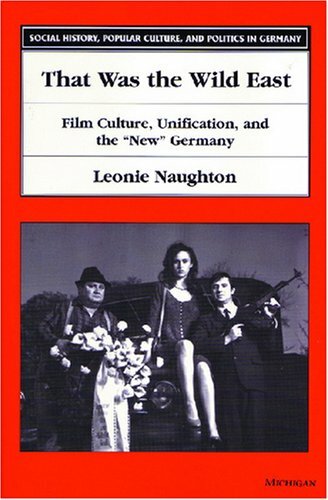 The ways in which German filmmakers represented unification throughout the 1990s are discussed with reference to a broad range of recent German films, and Naughton examines both divergent and convergent cinematic impressions of life in a recently unified Germany by 1990s filmmakers. Those interested in film studies and film history, German history and culture, as well as German unification and recent developments in German cinema, will find this book especially appealing. Leonie Naughton is a research associate, The University of Melbourne, Australia. This is not only a compelling read for students of German cinema, but also for anyone with an interest in contemporary Germany or film history, as it explores the fascinating interrelationship between German media, cultural landscape and politics in an era of upheavals. Given the lack of authoritative and comprehensive texts on German cinema in the light of the unification, I found this book both enlightening and indispensable for my studies. Leonie Naughton gives a broad overview of the various trends in film and society, as well as an in-depth analysis of issues such as the stereotyped portrayal of East Germany in Western-backed productions, and the difficulties faced by East German media. The writer bases her arguments upon close scrutiny of both well-known and obscure films which she colorfully evokes - one need not have seen many German films to grasp her thesis and enjoy her lively and eloquent survey. That was a wild book! This book is so good - a really engrossing read. I think That Was the Wild East Film Culture, Unification and the "New" Germany would be of value to anyone interested in the relationship between film, society and politics. Naughton analyzes a broad range of German films released in the decade following unification, examining not only their structure and styles, but also their critical and public reception. The psychological, cultural and economic upheavals experienced by the East Germans also makes for fascinating reading, especially to someone like myself who always believed that "the unfortunate citizens" of the East were only too happy to have the Iron Curtain swept aside and be presented with the keys to the paradise of Capitalism. This book is well written and researched and, as far as I can tell, is the only extensive English study to examine this period of German film history. I see that Thomas Elsaesser, Professor of German Film in Amsterdam, has praised the book's "impeccable scholarship' and "intrepid dedication." I am in complete agreement with him, and encourage everyone with an interest in this field (and even those who haven't) to grab a copy of this well written and engrossing book. 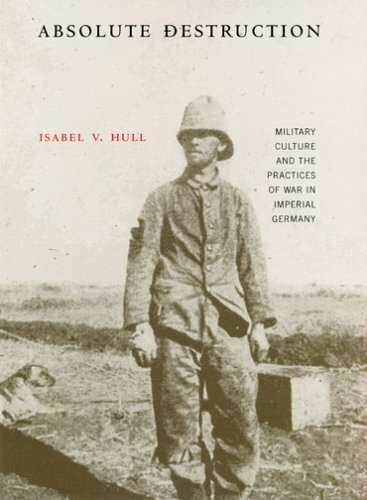 In a book that is at once a major contribution to modern European history and a cautionary tale for today, Isabel V. Hull argues that the routines and practices of the Imperial German Army, unchecked by effective civilian institutions, increasingly sought the absolute destruction of its enemies as the only guarantee of the nation’s security. So deeply embedded were the assumptions and procedures of this distinctively German military culture that the Army, in its drive to annihilate the enemy military, did not shrink from the utter destruction of civilian property and lives. Carried to its extreme, the logic of "military necessity" found real security only in extremities of destruction, in the "silence of the graveyard." Hull begins with a dramatic account, based on fresh archival work, of the German Army’s slide from administrative murder to genocide in German Southwest Africa (1904–7). The author then moves back to 1870 and the war that inaugurated the Imperial era in German history, and analyzes the genesis and nature of this specifically German military culture and its operations in colonial warfare. In the First World War the routines perfected in the colonies were visited upon European populations. Hull focuses on one set of cases (Belgium and northern France) in which the transition to total destruction was checked (if barely) and on another (Armenia) in which "military necessity" caused Germany to accept its ally’s genocidal policies even after these became militarily counterproductive. She then turns to the Endkampf (1918), the German General Staff’s plan to achieve victory in the Great War even if the homeland were destroyed in the process—a seemingly insane campaign that completes! the logic of this deeply institutionalized set of military routines and practices. Hull concludes by speculating on the role of this distinctive military culture in National Socialism’s military and racial policies. This book is so full of the authors bias that it is difficult to pick out any useful information.I was left throughout thinking that there were crucial facts missing and that the author picked and chose only those nuggets that would fit the thesis.Could have been an outstanding study, instead it just highlights the stereotypical view of the "evil" German. Hull writes a flawed, but interesting, study about the relationship between the ideological underpinnings of the Imperial Germany Army and Germany's military failures since the Franco-Prussian War.Hull main point is that the Prussian (and then Imperial German Army's, Gr. Reichswehr's) overwhelming bias toward operational effectiveness both created, and was created by, a view of warfare so dedicated to the dstruction of enemy forces that it was blind to the political and strategic dimensions of war.As a result, Hull claims, German logistics were problematical, German Military Occupation was disastrous, German strategy was neglected, and German policy was virtually non-existent.Put more broadly, she believes that the German Army was so focused on winning battles and campaigns that it did not have the foggiest idea of how to win (or emerge favorably from) a larger war. Hull also aims at some bigger points, which she only touches on indirectly.First, her analysis would imply that Germany's conduct of World War II was largely a continuation and (great) amplification of its conduct in World War I and in Africa.Many prominent Nazis -- Hitler, Roehm, and many others come to mind -- were front line soldiers in World War I and had absorbed that military culture.Second, and related, the Imperial German State in general had so completely absorbed and deified that military culture that the German government shared the same failings as the German military. There is much in what Hull says.But there are also several significant faults in her analysis.First, she dislikes the German Army, despite attempts to remain objective, and thus sometimes makes it look less effective than it was.For example, she claims that German and French losses at Verdun were about equal, something few others would support.Second, she is sometimes ambivalent, if not contradictory.For example, she condemns the German High Command for failing to acknowledge when it was beaten, as for example when the United States entered the war. Yet she condemns its 1918 offensive strategy as reckless gambling, claiming that Germany could have held out far longer if it had adopted a more defensive strategy.Now Hull is probably right -- once the United States entered the war, Germany was probably doomed.But if this is true, Ludendorff and Hindenburg would seem to have done Germany a favor by ending the agony in one year rather than three or four through their adoption of an all-or-nothing strategy. Actually, Germany came fairly close to a favorable result in World War I, even if it could not have "won" outright.If it had continued to negotiate in good faith, eschued unrestricted submarine warfare, and maintained a relatively defensive posture in the West, Russia would have collapsed and there would have been a real chance at an acceptable peace.Of course, as Hull's own analysis suggests (it would have been helpful if she had been more explicit here, but her fixation on Germany's weaknesses prevents her from doing so), Germany was incapable of formulating such a policy.She was commited to absolute victory and her civilian government was too fragmented and too military-minded to carry out a flexible political strategy.For this inflexibility, Hull rightly claims, Germany military culture was greatly to blame. This is a study of institutional extremism. It examines the German conduct of war from 1870 through 1918 (from the author's introduction).Part I of the book begins with the suppression of Native revolts in German Southwest Africa in 1904-1907. Part II speaks to Military Culture and the lessons of 1871 and Part III covers WW I. The author uses an extensive amount of primary resources to present a very compelling case, yet, also draws unsubstantiated conclusions from incomplete records and entries. Despite the attempt to remain objective, there is a readily detectable tone of bias. As a military analyst and instructor I felt the book was useful as a tool for comparing the lessons of the German experience with the US Military experience over the last 10 years. For instance: is the US Military only capable of thinking in Military terms?In light of Joint and Combined Operations in Afghanistan and Iraq, has the US Military morphed into a "polycratic" institution? Does the Diplomat stand with the soldier? Is there a set of mutually reinforcing values and characteristics that inhibit decision making? Regardless if these lessons are German, Indian or American, the questions for any Military are the same, are essential and must be asked. All in all, a good bookthat is a little heavy to read with some very compelling evidence, yet, also some bias and speculation in presentation. Perhaps total annihilation would be a good title for this book? 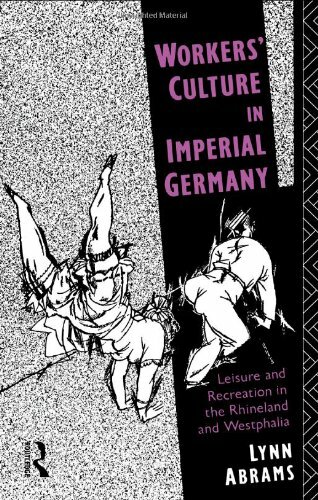 In this fascinating look at military culture in Imperial Germany, Isabel Hull has broken down the topic into three major categories:the development of the military culture, the definition of military culture in Germany, and how the military culture played out in the Great War during the period 1914-1918. In her opening section, Hull explains how the colonial wars of the early 20th century, where the Germans were attempting to suppress internal rebellions, became the precursor of an organizational culture that moved beyond suppression and into utilizing the mindset of total annihilation.Hull has largely examined the Herero (in Southwest Africa) as her case study, and the commanders of the German forces dispatched to quell the uprising.By examining military manuals and private papers of the military leadership, Hull demonstrates, quite convincingly, that the development of this strategy of utter destruction began during these wars. Hull then proceeds to explain how the military culture fit into the German military - almost like any organizational culture would pervade into a company.Further examination of diaries, letters, and other military papers explain how this strategy became the widely accepted tactic of German warfare.She explains how this concept differed from that of Britain's use of force to suppress rebels during the Boer War in an effort to explain that the pervasiveness of this thought process really only permeated the German psyche and not other European nations. Finally, the author explores how this strategy played out during the First World War (the "Great War").By evaluating everything from the execution of the Schlieffen plan to the use of civilians as hostages, Hull offers the reader a carefully constructed argument that this war was fought using the tactics developed over the last several decades, though that led to Germany's defeat since the German commanders were unable to accept losses in battles and simply pushed on instead. Overall, this is a very well written book, and one that is a good addition to the historiography of the Great War; we can now better understand why the German troops acted as they did on the battlefield, and how this war paved the way for the National Socialist ideology that would creep into German society and cause another, greater, war only two decades later. This is another piece of lowbrow anti-German propaganda dressed as historiography. The book is a mess of primary, yet selective and biased historical research, simplistic psycho-babble, ridiculous sociological-anthropological speculation, pathetic organization behavioural theorising and last but not least, absolutely third rate military history. The author is hell bent on proving that there is a German Sonderweg from the founding of the Second Reich to Hitler, that the vaunted German Army is nothing but foolish automatons predisposed to atrocities and mindless offensives. All in all, cheap trash billed as history.